“My blood is clean. 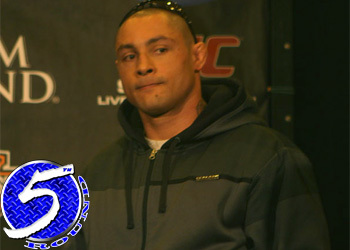 I haven’t used anything,” Thiago Silva told TATAME after he failed his UFC 125 drug test. While Silva did admit to producing a positive read, the Nevada State Athletic Commission have been waiting for the light heavyweight’s B-Sample to return from the lab before making a ruling. Well, it appears they have finally received the answers they were looking for. Unfortunately for the Brazilian, the results are no bueno. 4. On January 1, 2011, SILVA participated in a mixed martial arts contest in Las Vegas, Nevada, which he won by unanimous decision (the “Contest”). The Contest was conducted under the direction of the Commission. 5. Immediately before the Contest, on the same date, SILVA voluntarily submitted to urinalysis (the “Urinalysis”) and submitted a specimen for testing. 7. The Urinalysis reflects a Complete-Invalid Result indicating that the specimen submitted by SILVA is inconsistent with human urine. The results of the Urinalysis are reflected in the Toxicology Report, attached hereto as Exhibit 1. 8. The specimen submitted by SIVLA was also tested by the Sports Medicine Research & Testing Laboratory, which is accredited by the World Anti-Doping Agency. 9. The Test Report from the Sports Medicine Research & Testing Laboratory reflects that the specimen submitted by SILVA is inconsistent with human urine. The Test Report is attached hereto as Exhibit 2. 10. SILVA submitted an adulterated and/or substituted specimen for testing for the Urinalysis. This isn’t the first time non-human urine has been used for an MMA drug screening. Kevin Randleman submitted a urinalysis lacking any hormones to the NSAC for Pride 32 back in October of 2006. Randleman was suspended for one year from the date of his loss to Mauricio “Shogun” Rua. UFC 125 took place January 1st inside the MGM Grand Garden Arena in Las Vegas. Silva posted a unanimous decision victory over Brandon Vera on New Year’s Day. If this report holds true, the verdict will be overturned to a ‘No Contest’ within the coming days.